"The technicals are saying to sell it," Wald said Monday on CNBC's "Trading Nation." "This is a stock we've been bearish on for a while and we're still bearish on and recommend selling." J.P. Morgan analyst Stephen Tusa is also bearish. His downgrade to sell set off GE's plunge Monday, its deepest drop since early December. Tusa also cut his price target to $5 from $6. "What's notable about [Monday's] weakness is that it's occurring below the bearish slope of the stock's 200-day moving average," said Wald. "What this is showing is that the near term is lining up with the long-term weakness. We see this as a resumption of GE's long-term downtrend." Monday's sell-off aside, GE has outperformed the market this year. It has roared 48 percent higher off its Dec. 11 bottom and roughly doubled the gains seen across the broader market. "This recent bounce really is what happens when you get a stock that goes down 67 percent and is trading nearly at option value," said Gina Sanchez, CEO of Chantico Global, on "Trading Nation" on Monday. 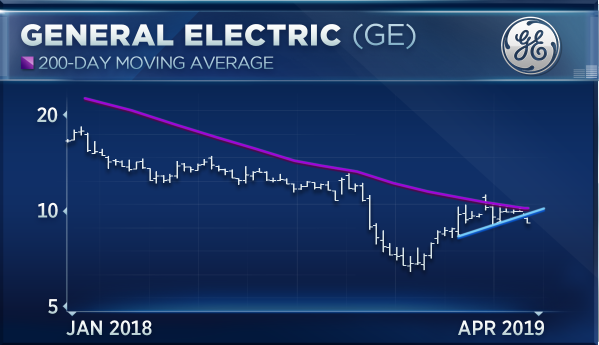 Though GE has raced off its lows, it remains 37 percent below its 52-week high set in May. Sanchez adds that GE's turnaround plans will take years to bear fruit, a time frame that could test investors' patience. GE CEO Larry Culp has targeted 2020 and 2021 as years when the company's performance will show marked improvement. "That's a long time from now and between now and then we're probably going to have an economic slowdown," said Sanchez. "It's not a good environment to be pulling off a turnaround and I think that is really what's going to keep this stock from bouncing much higher than its option value bounce."